Andrew Nicholson, pictured here at the Land Rover Burghley Horse Trials 2012 with Calico Joe, is all set for this year’s edition (5-8 September), which will be the last leg of the HSBC FEI Classics 2012/2013 series. (Photo: Kit Houghton/FEI). Lausanne (SUI), 4 September 2013 – World number one Andrew Nicholson (NZL) will be the rider in the spotlight at this weekend’s Land Rover Burghley Horse Trials (GBR) on 5-8 September, the last leg of the HSBC FEI Classics 2012/2013 series. The runaway leader of the current HSBC FEI Classics series followed victory at Burghley 2012 with a remarkable run of three more CCI4* wins (at Pau, Kentucky and Luhmühlen), and few would bet against this superb horseman extending his winning run to include a fourth trophy at the beautiful Lincolnshire venue. Nicholson, also the leader of the HSBC Rider Rankings, is the only competitor with three rides: he has last year’s winner, the attractive grey Avebury, plus Pau winner Nereo and the racing-bred Irish Thoroughbred Calico Joe, a strong galloping horse with good CCI4* form. His perennial rival William Fox-Pitt (GBR), second on the HSBC FEI Classics leader board and also lying second in the HSBC Rankings, has two chances to extend his remarkable Burghley record to a historic seventh win. Fresh from his individual bronze medal success at the HSBC FEI European Championships in Malmö (SWE), he rides the 2011 winner Parklane Hawk, a quality New Zealand Thoroughbred, and the classy Selle Francais Neuf des Coeurs. There’s more to this fascinating competition than the old Nicholson/Fox-Pitt rivalry, however. 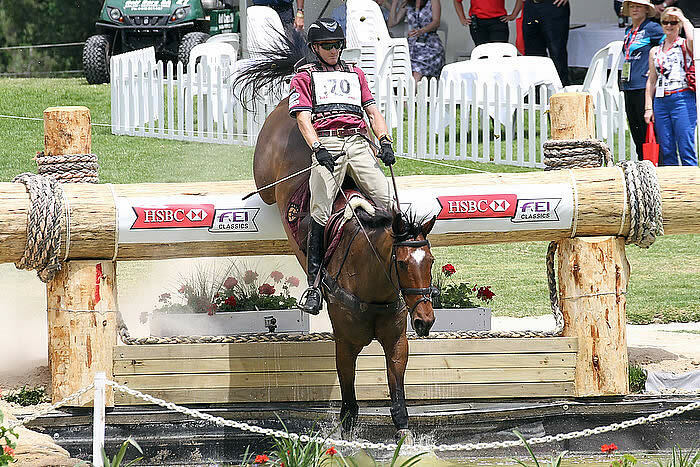 At Badminton in May, both riders were quietly trumped by Jock Paget (NZL), who is breathing down Fox-Pitt’s neck in third place on the HSBC FEI Classics leader board. The stylish Kiwi brings his two best horses, Badminton winner Clifton Promise plus the equally talented Clifton Lush, and he could easily join the elite band of riders who have won both of Britain’s CCI4*s in the same 12 months. Much interest will surround the Burghley début of Ingrid Klimke (GER), the newly crowned European team gold and individual silver medallist. She rides the 16-year-old FRH Butts Abraxxas, her partner in the last six team championships, and if they can show improved form in the final Jumping phase, they could take the top prize. Klimke’s team mate, Andreas Dibowski, reunited with his top horse FRH Butts Leon, has winning credentials too, and if all goes right for Bettina Hoy with the enigmatic but talented Lanfranco, 10th last year, the German national anthem could ring out over Burghley for the first time in its 52-year history. Other notable newcomers to Burghley are Paget’s friend and trainer Kevin McNab (AUS) with Clifton Pinot, fifth at Luhmühlen this year, Canadian Rebecca Howard with Riddle Master, 12th at Badminton, and Astier Nicolas, winner of a European team bronze for France in Malmö on Sunday. The 23-year-old Frenchman rides one of the youngest horses in the field, the nine-year-old “flying pony” Quickly Du Buguet. Aside from the ever-reliable Fox-Pitt, British hopes also rest with the 2009 winner Oliver Townend, this time on the former Nicholson ride Armada, fourth last year; the 2003 victor Pippa Funnell, on the magnificent Redesigned; and Kristina Cook on the up-and-coming De Novo News. Contenders for the HSBC Training Bursary, worth $1,000 to the highest-placed CCI4* newcomer, include Britons Matt Heath and Alex Postolowsky, as well as Wills Goodhew and Sophie Jenman, who are both just 21 years old. Burghley’s undulating parkland always offers a true Cross Country challenge, but this year Course Designer Captain Mark Phillips has kept everyone guessing as he has re-routed the track. It starts in the opposite direction to last year, which means the arena fences, including Lord Burghley’s Hurdles, come early; the influential Discovery Valley (fence 5) asks a completely different question, and the famous drop at the Classics Leaf Pit is at fence 7. Over 70 horses representing 11 nations will trot-up in front of the Ground Jury at the first horse inspection this afternoon. The Dressage phase, which opens what promises to be a thrilling competition, starts at 9am tomorrow. Follow the action on www.burghley-horse.co.uk. Download the HSBC FEI Classics 2012/2013 press kit: www.feipresskits.org. At the centre of HSBC’s sponsorship is a commitment to the development of the sport of Eventing at every level. As part of its support of the HSBC FEI Classics, HSBC has introduced a Training Bursary. This is a unique award which is presented to the highest placed rider never to have previously completed a 4-star level event. The winning rider receives a training voucher to the value of US $1,000 to be spent on sessions with a trainer of the athlete’s choice approved by the FEI and National Federation. HSBC, the platinum partner of the FEI and global sponsor of Eventing, has supported the HSBC FEI Classics series, which unites the top end of the international Eventing circuit, since 2008. In our HSBC FEI Hub, you can access the HSBC FEI Classics 2012/2013 series standings, HSBC Rankings and all news relating to the current and past series. The HSBC FEI Classics prize fund is the largest on offer in the sport of Eventing on an annual basis. At the end of the HSBC FEI Classics 2012/2013 season, the five riders with the highest number of points collected across the six HSBC FEI Classics events will share a total prize fund of US$333,000 split as follows: 1st – US$150,000 (Series Champion); 2nd – US$75,000; 3rd – US$50,000; 4th – US$33,000; 5th – US$25,000. The rider at the top of the HSBC Rankings at the end of the 2013 Eventing season will receive a US $50,000 bonus. The winning rider will be announced in December 2013. Join the FEI on Facebook & Twitter. Simply the best: the matchless Andrew Nicholson and Mr Cruise Control, winners at Luhmühlen CCI4* (Photo: Kit Houghton/FEI). Lausanne (SUI), 16 June 2013 – There were emotional scenes when Andrew Nicholson and Mr Cruise Control triumphed at Luhmühlen, presented by DHL Paket, the penultimate leg of the HSBC FEI Classics. It was the 51-year-old New Zealander’s fourth CCI4* victory in a year, but the first for his long-time loyal owners, Robin and Nicky Salmon, who have often seen their striking-looking grey gelding come close to major honours without ever taking the big prize. “He’s a big horse that’s taken time but he’s kept improving through all his training, and that means that out of all my four-star wins this one is particularly rewarding,” said the invincible Nicholson, who has now won four of the world’s six CCI4*s.
Zara Phillips (GBR), who finished second on Trevor Hemmings’ High Kingdom, put pressure on Nicholson right until the end with a beautifully ridden clear Jumping round. However, the six-time Olympian rose to the occasion magnificently, just rattling the second fence but soaring over the rest to finish on his Dressage score of 38.0. Phillips was clearly thrilled by the continuing improvement shown by her Olympic team silver medallist. “He’s getting better all the time,” she said. Both the two leading horses are Irish-bred: Mr Cruise Control is by the great jumping sire Cruising and High Kingdom is by Master Imp. In contrast, William Fox-Pitt’s two horses, which rose to third and fourth places with immaculate clear rounds, are both from continental stock. Neuf des Coeurs, third, is a smart Selle Francais by Nidor Platier, and Lionheart, fourth, is a majestic German-bred by Lancer lll. Neuf des Coeurs missed much of last season through injury and Lionheart, one of the best jumpers on the circuit, is clearly back to his best after inexplicably tiring on the Olympic Cross Country last year. Kevin McNab (AUS) had modestly predicted that he wouldn’t be making either Nicholson or Phillips too nervous in the final phase, but he only had one rail down on Clifton Pinot, slipping from overnight third to fifth place. Fellow Australian, Andrew Hoy, who had been in fourth after Cross Country with Rutherglen, did not present the 10-year-old at this morning’s horse inspection. The winner, Nicholson, again proved his skills with a top-10 finish on his catch ride, Rathmoyle King. He hit two rails on the 15-year-old grey, but that wasn’t enough to drop him in the final placings and he held onto sixth. With just Burghley to come in the HSBC FEI Classics, it seems that 2013 is going to be Nicholson’s year. Andrew Nicholson (NZL), 51, who currently heads both the HSBC Rankings and the HSBC FEI Classics, is acknowledged as one of the most hard-working and naturally talented horsemen in Eventing. He first came to England as an 18-year-old in 1979 and worked with racehorses. 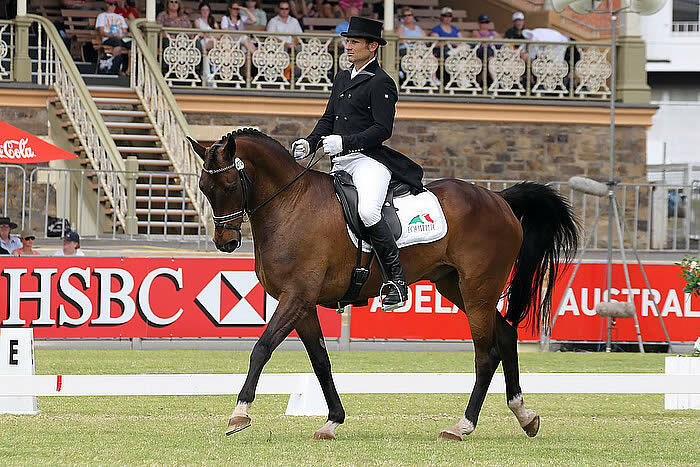 His first CCI4* was Badminton in 1984 where he earned a place on the first New Zealand Olympic team, at Los Angeles. He has since ridden at five more Olympic Games, winning team silver in 1992 and team bronzes in 1996 and 2012, when he finished fourth individually on Nereo. He also won team gold at the 1990 FEI World Equestrian Games in Stockholm (SWE) and team and individual bronze on Nereo at the 2010 Alltech FEI World Equestrian Games in Kentucky (USA). This is his sixth CCI4* win, following three Burghley victories, in 1995 on Buckley Province, in 2000 on Mr Smiffy, and in 2012 on Avebury, plus Pau in 2012 on Nereo and Kentucky this year with Quimbo. Last year, he finished second in the 2011-2012 HSBC FEI Classics and won the HSBC Rider Rankings. Andrew has two adult daughters, Rebecca and Melissa, and two young children, Lily and Zak, with his partner Wiggy Channer. They live near Marlborough, Wiltshire. Our signature twitter hashtags for this series are #HSBC and #Eventing. We encourage you to use them, and if you have space: #HSBC FEI Classics #Eventing. Andrew Nicholson and Cruise Control sailed into the lead after Cross Country at Luhmühlen CCI4* (Photo: Kit Houghton/FEI). Lausanne (SUI), 15 June 2013 – Andrew Nicholson (NZL) opened and closed Cross Country day with two perfect rides and is now in the lead on Mr Cruise Control, the last horse on the course at Luhmühlen, presented by DHL Paket, the penultimate leg of the HSBC FEI Classics. Nicholson is also sixth on the pathfinder Rathmoyle King, but he got soaked in the middle of the day when Qwanza fell on landing in the influential first water complex, fence 4. Zara Phillips (GBR), who is only 1.7 penalties behind Nicholson in second place, was the heroine of the day as a violent storm broke when she was midway round the course. However, neither she nor her horse High Kingdom appeared inconvenienced by the blinding rain and howling wind. Kevin McNab (AUS), the man who taught this year’s Badminton winner Jock Paget (NZL) to ride, is now having his moment in the spotlight and is third on Clifton Pinot. The top of the leaderboard has been considerably rearranged. Dressage leader Ingrid Klimke (GER) retired after Tabasco TSF tripped out of the DHL Paket Komplex (fence 4) and ran past the boathouse which was the final element. Lucinda Fredericks (AUS), second on Flying Finish, clocked 19.6 time penalties and is now 11th. She explained that she and Flying Finish were not fully fit due to her being injured in a fall in March. Dirk Schrade (GER), seventh after Dressage on Edino, also retired after a steering problems at fence 4. Peter Thomsen (GER), fifth after the first phase on Horseware’s Cayenne, incurred 22.4 time penalties and is now 16th and Kai Rüder (GER), sixth after Dressage, had a runout on the onward-bound stallion Le Prince des Bois at fence 28. Andreas Dibowski (GER) and FRH Butts Avedon are now best of the home side, having risen from 16th to ninth with just 3.6 time penalties. Like Nicholson, William Fox-Pitt (GBR) produced two clear rounds inside the optimum time of 11 minutes 14 seconds, and is now fifth on Neuf des Coeurs and seventh on Lionheart. Jonelle Richards (NZL), Nicholson’s Olympic team mate, was another to finish on a clean sheet and is in eighth place on Flintstar. There were 25 clear rounds, 10 of which were inside the time, and 34 horses completed. The most surprising mishap was for the usually foot-perfect combination of Nicola Wilson (GBR) and Opposition Buzz. The black gelding tripped in the water at fence 4, took off early at the step out and tipped over the boathouse. Neither he nor his rider was hurt. The only serious accident of the day was the fall of French rider Emeric George and P’tite Bombe at fence 12, a rounded obstacle topped with brush, in the main arena where there were no other incidents. The horse was taken to a veterinary clinic for examination where, sadly, the decision was taken to have him humanely put down. Nicholson, 51, who is having the best run of success in his long and hardworking career, is now in line to win his fourth CCI4* in 12 months. This would greatly enhance his lead in the HSBC Rider Rankings and the HSBC FEI Classics, but he said he was “just going to live for the moment tonight”. Ingrid Klimke and Tabasco TSF produced a flawless test to take the lead after Dressage at Luhmühlen CCI4*. (Photo: Kit Houghton/FEI). Lausanne (SUI), 14 June 2013 – Ingrid Klimke (GER) and her black gelding Tabasco TSF made a perfect picture as they took the lead after Dressage at Luhmühlen, presented by DHL Paket, the penultimate leg of the HSBC FEI Classics. Klimke, who sets the standard for the Dressage phase in Eventing, earned a mark of 34.0. The 45-year-old, who finished fourth in the Freestyle at last week’s German National Dressage Championships, has a 2.7-point lead over another expert in the field, Lucinda Fredericks (AUS) on last year’s runner-up, Flying Finish. Fredericks’ result was all the more creditable as she suffered a nasty fall in March and the resulting injury to her collarbone required surgery. She had two months out of the saddle and has only ridden Flying Finish in one competition this year. Of her Dressage test, she commented: “I think it was better than last year. Flying Finish is such a genuine horse and I think will continue to improve.” Fredericks also praised the opportunity Luhmühlen offers for arena familiarisation, and for the consistency of surfaces in the warm-up areas and the competition arena. Andrew Nicholson (NZL) looks set to increase his commanding lead in the HSBC FEI Classics, and he has three chances to do it. He is in third place on 38.0 after a polished display on the Pegasus-like grey, Mr Cruise Control, and is also in touch in 14th on Rathmoyle King and 20th on the Spanish-bred mare Qwanza. Zara Phillips’ (GBR) visibly more established performance on her Olympic horse High Kingdom has put her in fourth place on 39.7, the gelding’s best mark at this level. The Irish-bred bay was markedly more engaged and rounded than at Badminton, where he had a run-out across country, and was “very bouncy to ride,” according to Phillips. Luhmühlen’s defending champion, Michael Jung (GER), had to withdraw Leopin just before the competition, but his compatriots are to the fore, with Peter Thomsen (Horseware’s Cayenne), Kai Rüder (Le Prince des Bois) and Dirk Schrade (Edino) in fifth, sixth and seventh places. The home side does not have it all their own way, however. Five nations are represented in the top 10, with Japan’s Kenki Sato, who is trained by Jung’s father Joachim, in eighth on Chippieh, just ahead of two Australians, Andrew Hoy (Rutherglen) in ninth, and Kevin McNab (Clifton Pinot), 10th. Bettina Hoy (GER) may have caused a major form upset after finishing the Dressage phase in 50th and last place with a score of 80.8, but she deserved 10s for her stickability. Lanfranco TSF was thoroughly wound up and refused to co-operate, rearing repeatedly in the rein-back and giving Hoy a rough ride throughout. Luhmühlen received a drenching of rain last night and the footing on the Cross Country will be all the better for it. Klimke, who has two Olympic gold medals but is yet to win a CCI4*, thinks Tabasco’s success over a variety of CIC3* courses will stand him in good stead. Lausanne (SUI), 12 June 2013 – Andrew Nicholson (NZL), who holds a commanding lead in the HSBC FEI Classics, heads to Germany this week for the penultimate leg of the series at Luhmühlen CCI4*, presented by DHL PAKET (13-16 June). Nicholson, the 2012 HSBC Rankings champion, is clearly not about to squander his excellent chance of becoming the first Kiwi to head the HSBC FEI Classics, and is travelling to the premier German event with three good rides. He brings the Spanish-bred mare Qwanza, seventh at Kentucky last year, the striking grey Mr Cruise Control, by Cruising, fourth at Luhmühlen in 2010, plus Rathmoyle King, previously ridden at CCI4* level by Carolyne Ryan-Bell (GBR). Nicholson has a 13-point advantage in the HSBC FEI Classics over his compatriot Jock Paget, winner of a thrilling Badminton (GBR) last month. Paget is also intent on maintaining his foothold on the HSBC FEI Classics and rides CCI4* débutant Bullet Proof. William Fox-Pitt (GBR), three times a winner of the HSBC FEI Classics and currently third in the rankings, also has three top rides: his 2012 Olympic horse Lionheart, Neuf des Coeurs and Cool Mountain. The latter, a CCI4* winner at Kentucky in 2010 and a world team gold and individual silver medallist, is back in work after a season’s absence through injury. Two more combinations from Britain’s Olympic silver medal team will be in action at Luhmühlen: Nicola Wilson rides the crowd-pleasing Opposition Buzz, a brilliant Cross Country horse, and Zara Phillips has re-routed High Kingdom after his run-out in the Badminton lake. Two members of Australia’s Olympic team return to Luhmühlen after good placings here last year: Lucinda Fredericks, back in action after breaking her collarbone in a fall this spring, comes back with Flying Finish, the 2012 runner-up, and Andrew Hoy has Rutherglen, who finished sixth in 2012. Olympic champion Michael Jung (GER), currently lying fourth in the HSBC FEI Classics, will ride last year’s Luhmühlen winner, Leopin, another to have a Cross Country refusal at Badminton. A strong home entry includes double Olympic gold medallist Ingrid Klimke on Tabasco TSF, a dual CIC3* winner, Bettina Hoy on Lanfranco TSF, the horse that has brought her back to top level with 10th place at Burghley last year, and Julia Krajewski, who rides London-Return and has strong claims to the HSBC Training Bursary awarded to the best first-time CCI4* completion. Luhmühlen is an important event for the German squad, as it is the major selection trial for the HSBC FEI European Eventing Championships in Malmö (SWE) in August. There are 51 horses entered from 11 nations: Australia, Belgium, Ecuador, France, Great Britain, Germany, Ireland, Netherlands, New Zealand, Sweden and USA. Cross Country Course Designer Mark Phillips (GBR) says that although his track runs on a similar route to last year, it is “a very different CCI4* test which will require concentration all the way round”. The first water complex comes up at fence 4, the DHL PAKET Komplex, with a big boat fence into the water and a bounce distance out up a step and over another boat. The biggest fence on the course is the Gärtnerei Wredes Rennbahnsprung at 7, which is 1.45m and 2m wide at the top and 3m wide at the bottom. Capt Phillips says the HSBC Complex at 9-12 in the main arena is, again, the most technical, with two hedge to corner questions on acute angles. “Hopefully, all horses and riders will come home with a smile on their faces,” he says. Andrew Nicholson, pictured here en route to victory at Les Etoiles de Pau CCI 4* (FRA) with Nereo. (Photo: Kit Houghton/FEI). Lausanne (SUI), 23 April 2013 – All eyes will be on Andrew Nicholson (NZL) this weekend as he heads for the Rolex Kentucky Three-Day Event (USA) on 25-28 April to try to extend his lead in the HSBC FEI Classics 2012/2013 series. Nicholson enjoyed a remarkable run of success last autumn, winning Burghley CCI4* (GBR), Blenheim CIC3* (GBR), Boekelo CCI3* (NED) and Pau CCI4* (FRA) in quick succession to take the world number one slot in the HSBC Rankings. He also capped a brilliant season by finishing second, behind William Fox-Pitt (GBR), in the HSBC FEI Classics 2011/12 and makes no secret of the fact that he would like to go one better this time and become the first New Zealander to head the leaderboard. To add to the excitement, if Nicholson wins at Kentucky, he will set up the first ever head-to-head for the Rolex Grand Slam, with Fox-Pitt, the weekend after at the Mitsubishi Motors Badminton Horse Trials (GBR) on 3-6 May. This tantalising scenario is eminently possible, as Nicholson has two useful rides at Kentucky: Calico Joe, placed in two CCI4* last year, and the striking black horse Quimbo, one of the many Spanish-bred horses he favours competing. Nicholson has described the latter, winner of Boekelo in 2012, as one of the best horses he has ever sat on – some compliment from the man who has probably ridden a greater variety of event horses than anyone else. However, he faces stiff competition in Kentucky. Phillip Dutton (USA), who has a great record at the premier US event and won in 2008, has two exciting up-and-coming horses, Fernhill Eagle, 12th last year, and Mighty Nice, a reserve for the London Olympic Games. Other leading US riders in action include Buck Davidson, three-handed on Park Trader, Mar de Amor and Ballynoe Castle RM, Dutton’s Olympic team mate Boyd Martin on the nine-year-old Trading Aces and the experienced combination of Will Coleman and Twizzel. Nicholson has three fellow travellers across the Atlantic: his compatriot Jonelle Richards (The Deputy), a member of New Zealand’s bronze medal team at the London Olympic Games, plus two former Kentucky winners, Fox-Pitt and Mary King (GBR). King, who became the first rider to finish first and second at Kentucky, in 2011, and is the only woman to have won the HSBC FEI Classics, returns with the powerful jumper Fernhill Urco. The grey featured in that memorable 2011 result, in second place, and is returning from a year on the sidelines. Fox-Pitt also has good ammunition: his two rides are the German-bred Seacookie TSF, the horse that gave him his record 50th CCI win last year, at Blenheim, and the chestnut stallion Chilli Morning, winner of Bramham CCI3* last year. A total of 47 athletes from seven nations will be competing in Kentucky, with 14 candidates – 11 from the USA and three from Canada – for the $1,000 HSBC Training Bursary awarded to the highest placed rider never to have previously completed a 4-star event. The Ground Jury will be made up of Nick Burton (GBR), who judged at the London Olympic Games, as President, along with Christina Klingspor (SWE) and Brian Ross (USA). Tom Ryckewaert (BEL) will be Technical Delegate and Derek di Grazia (USA) is now in his third year as Course Designer. The action kicks off at the Rolex Kentucky Three-Day Event on 25 April, with live results on www.rk3de.org. Lausanne (SUI), 7 March – HSBC, platinum partner of the FEI, will wind up its association with the FEI at the end of the 2013 season after six years as the global sponsor of Eventing. The global banking giant, which put its name to the HSBC FEI Classics when it was first created in 2008, will remain as title sponsor of the series until the end of the current cycle at Burghley (GBR) in September. 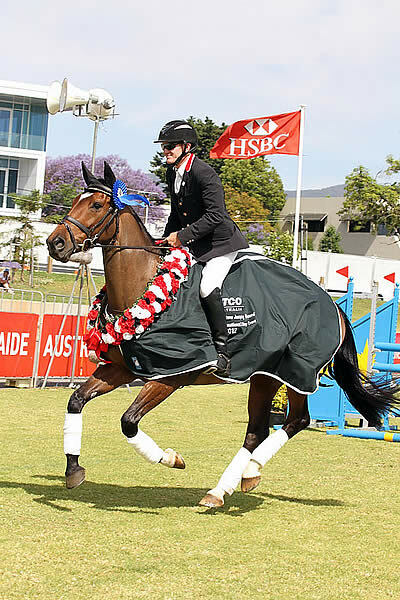 Pau (FRA) and Adelaide (AUS), which start the new 2013/2014 series, will be supported by HSBC and the cash award to the leading rider in the HSBC Rankings will be presented at the end of 2013. HSBC, a familiar name on the international sporting circuit, is reviewing its overall sponsorship strategy and plans to focus on other sporting events in its key markets. “We have had five wonderful years with the HSBC FEI Classics, and still have another one to go, and the series has proved hugely successful,” HSBC Group Head of Sponsorship, Giles Morgan, said. “We would like to think that the series has now come of age and, as a result of its phenomenal success since we came in as title sponsors in 2008, that it will be snapped up by another sponsor keen to get global visibility in the equestrian world. FEI Secretary General Ingmar De Vos paid tribute to HSBC for its support of equestrian sport. “HSBC has been a really great sponsor to work with and we are grateful that they had the vision to support a totally new concept, staying with it right from its conception through to its place now as one of the FEI’s flagship series. The HSBC FEI Classics has proved hugely popular with riders and with fans of the sport, and HSBC’s sponsorship has meant a major increase in prize money for Eventing which, in turn, has resulted in increased media coverage and visibility for our sport. Lausanne (SUI), 25 November 2012 – New South Wales professional Craig Barrett, leader after the Cross Country in Adelaide (AUS), produced a classy performance with Mr and Mrs Keith Osborne’s Sandhills Brillaire in today’s final Jumping phase to clinch the title at the second leg of the HSBC FEI Classics 2012/2013. This was Craig’s first 4* event, for which he earned the HSBC Training Bursary, which is awarded at every leg of this prestigious series to the highest placed rider never to have previously completed a 4* event. It is the first time that the winner of the HSBC Training Bursary has been top of the line-up. It was a dramatic Cross Country day that saw the top three after Dressage failing to make it through the finish flags. Barrett produced the run of the day with the competition trailblazing home-bred Staccato mare, adding just 0.8 of a time penalty to take the lead with a two-day total of 51.80. Barrett’s other ride, Wendela Jamie, had a runout at the costly number 13, a skinny fence on a related distance off the island in Rymill Lake, and it was here too that Stuart Tinney came to grief and retired after the big grey, Pluto Mio avoided the issue twice. Lausanne (SUI), 23 November 2012 – Beijing Team Silver medallist Shane Rose had a good day at the office today in Adelaide, taking the lead in the HSBC FEI Classics Dressage phase, as well as the CCI 2* competition. Rose claimed the early lead in the HSBC FEI Classics with 45.80 penalties riding the Leder family, Jamie McDonald and Lee Hokianga’s Australian-bred Warmblood, APH Moritz by APH Coriolo. He is closely followed by HSBC Bursary candidate Craig Barrett, who has started but never completed the four-star competition in Adelaide, but certainly means to do so this year riding the 2011 Melbourne CCI 3* winner, Wendela Jamie. Henry and Helen Hicks’ impressive Thoroughbred gelding is just a breath away on 47.30 penalties. And just over a point away from Barrett, Stuart Tinney is well placed in third with John and Jane Pittard’s 2012 New South Wales Eventing Champion, Pluto Mio.